อิลยูชิน อิล-18D  1 — ? ? ? ↑ "» Pyongyang Airport provides flight service worldwide". Korea-dpr.com. สืบค้นเมื่อ 9 October 2010. ↑ 3.0 3.1 "Directory: World Airlines". Flight International. 27 March 2007. p. 59. ↑ 5.0 5.1 "World Airlines Survey". Flight Global: 512. 13 April 1961. สืบค้นเมื่อ 5 October 2014. ↑ 7.0 7.1 "'World's worst airline' launches online booking". Telegraph. 31 May 2011. สืบค้นเมื่อ 2012-10-25. ↑ "North Korea's quirky (and unsafe) Air Koryo survives and, increasingly, appears to thrive". International Herald Tribune. 29 March 2009. สืบค้นเมื่อ 9 October 2010. ↑ "North Korean Economy Watch » Blog Archive » Air Koryo launches Shanghai-Pyongyang flights". Nkeconwatch.com. 28 July 2010. สืบค้นเมื่อ 9 October 2010. ↑ "2010年*上海=平壤8月散客*出团计划 行行摄摄 旅游摄影 出行旅游论坛". www.dayout.com.cn. สืบค้นเมื่อ 9 October 2010. ↑ "Photo ť P-814 (CN: 66368) Air Koryo Tupolev Tu-134 by LGY". Jetphotos.net. สืบค้นเมื่อ 9 October 2010. ↑ 14.0 14.1 "Al - Malek International Group". Almalekint.com. สืบค้นเมื่อ 2012-10-25. ↑ JL (2012-02-23). 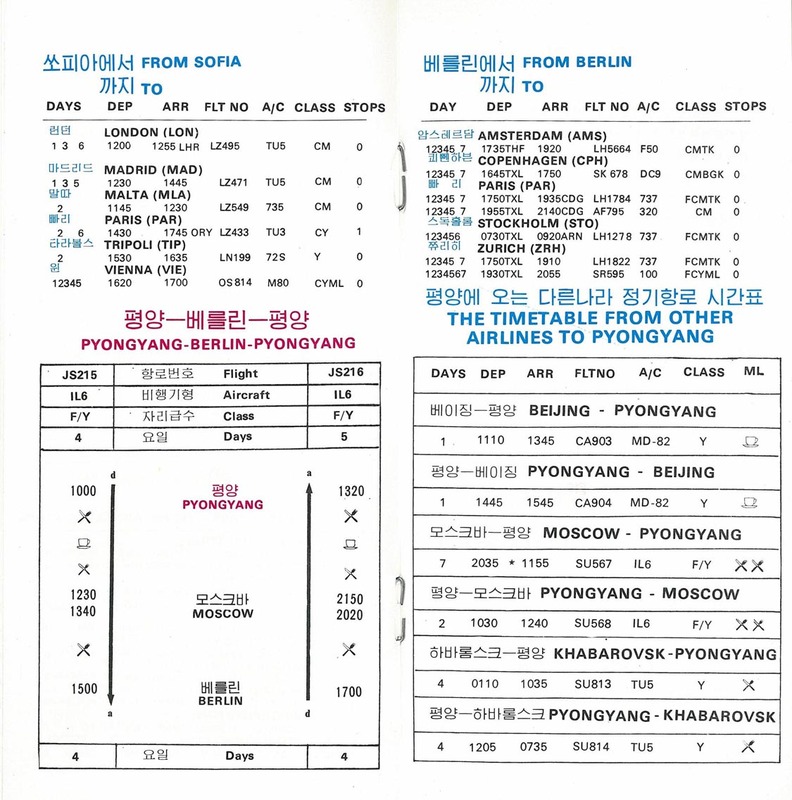 "Air Koryo to Start Pyongyang – Harbin Charter service from late-Apr 2012 | Airline Route – Worldwide Airline Route Updates". Airlineroute.net. สืบค้นเมื่อ 2013-08-15. ↑ JL (2012-03-19). "Air Koryo S12 Operation Changes to Kuala Lumpur | Airline Route – Worldwide Airline Route Updates". Airlineroute.net. สืบค้นเมื่อ 2013-08-15. ↑ 18.00 18.01 18.02 18.03 18.04 18.05 18.06 18.07 18.08 18.09 18.10 18.11 "Air Koryo - The Official Webpage of the national airline of the DPRK". Korea-dpr.com. สืบค้นเมื่อ 9 October 2010. ↑ "How to get to North Korea". Koreakonsult.com. สืบค้นเมื่อ 9 October 2010. 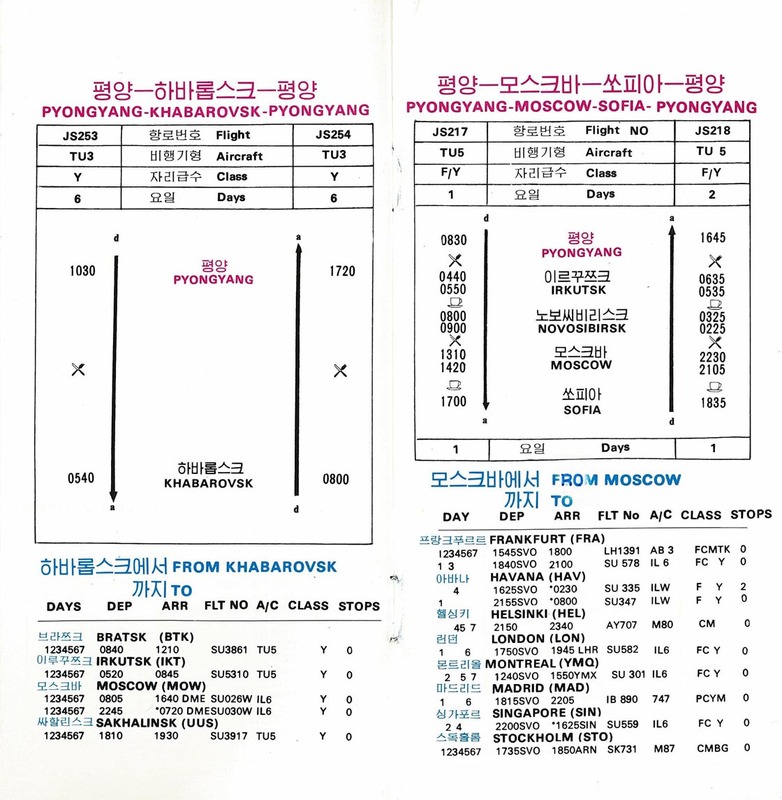 ↑ "Pyongyang-Khabarovsk flights running for 1st time in decade". Findarticles.com. 8 April 2002. สืบค้นเมื่อ 9 October 2010. ↑ "Photo ť P-881 (CN: 3647853) Air Koryo Ilyushin IL-62M by Pavel Adzhigildaev". Jetphotos.net. 7 September 2009. สืบค้นเมื่อ 9 October 2010. ↑ "Airport Departures & Arrivals". Flightstats.com. 30 October 2008. สืบค้นเมื่อ 9 October 2010. ↑ sutthisakw Sutthisak W (4 April 2009). "SjeiIf869718-02". Flickr. สืบค้นเมื่อ 9 October 2010. ↑ "Air Koryo launches Shanghai-Pyongyang flights". North Korean Economy Watch. 28 July 2010. สืบค้นเมื่อ 9 October 2010. ↑ "Direct tourist charter flights from Shanghai to Pyongyang to be launched". - People's Daily. 23 July 2010. สืบค้นเมื่อ 9 October 2010. ↑ "Customer reviews on Air Koryo". Airlinequality.com. สืบค้นเมื่อ 9 October 2010. ↑ 33.0 33.1 "Welcome to Air Koryo!". Air Koryo. สืบค้นเมื่อ 23 October 2012. ↑ 34.0 34.1 "1991 time table". สืบค้นเมื่อ 9 October 2010. ↑ "air koryo | 2003 | 2045 | Flight Archive". Flightglobal.com. สืบค้นเมื่อ 9 October 2010. ↑ "N. Korean plane to test-fly direct air route with South". Asia Africa Intelligence Wire. 20 July 2002. ↑ "Air Koryo". ch-aviation.ch. สืบค้นเมื่อ 2013-08-15. ↑ "Самолёт Ту-204-100В передан авиакомпании "Air Koryo" – Аргументы и Факты". Ul.aif.ru. สืบค้นเมื่อ 9 October 2010. ↑ 44.0 44.1 "EU Bans All Airlines From Philippines, Sudan in New Blacklist". BusinessWeek. 30 March 2010. Archived from the original on 29 September 2010. สืบค้นเมื่อ 9 October 2010. ↑ "Aviation Safety Database report". Aviation-safety.net. 1 July 1983. สืบค้นเมื่อ 9 October 2010. ↑ "Commission updates the list of airlines banned from the European airspace". Europa Press Release Database. 30 March 2010. ↑ "EU Upholds Flight Ban". Radio Free Asia. 13 January 2010. ↑ "Airline Rating". Skytrax. สืบค้นเมื่อ 7 December 2013. หน้านี้แก้ไขล่าสุดเมื่อวันที่ 18 กุมภาพันธ์ 2562 เวลา 21:21 น.